As you may know, France has no petroleum reserves and must rely on other, often unstable, countries for their supply of these products. 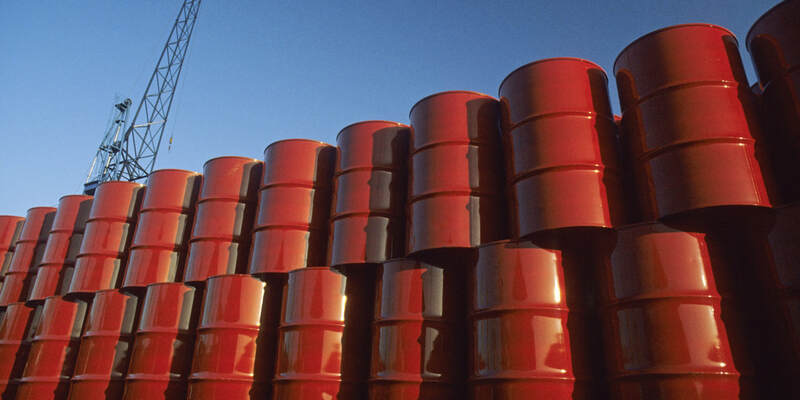 They have made a lot of progress in this effort over the past 43 years since the oil embargo. They generate over half of their electricity using nuclear power. They are also doing more with alternative fuels. In the area of energy conservation, they have been renovating all of their old buildings to be tighter with super-efficient heating and cooling systems. Those buildings look old on the outside, but most of them are super-modern on the inside. In the area of transportation, they are far advanced. Their train system extends through all parts of the country, and it’s fast and cheap. The cars they drive are tiny, and it's not unusual to see parking places for recharging electric cars. 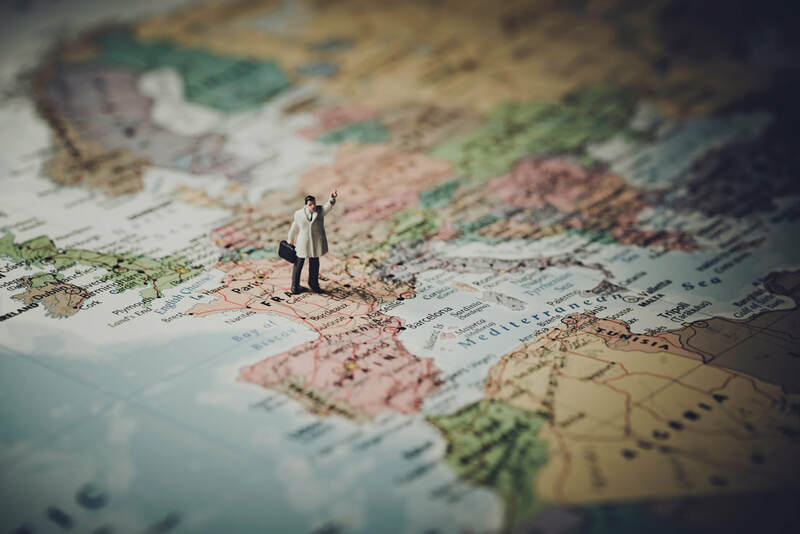 The reason I wrote this blog is to tell you about the Energy Consumption Information that French real estate agents are adding to their home sale listings. There is a colorful graph on the bottom of the page that goes from lowest to highest costs in terms of heating the home or apartment. You don't have to understand French to understand that the example given is in the most energy-consuming category. Keep in mind they measure energy consumption in kilowatt hours (KWH) instead of BTUs, as we do here. This is excellent information for anyone shopping for a home. Too often I have seen young couples get into a home without knowing how much it will cost them to heat. There have been some who have lost their homes or have trouble heating their homes because of this sad situation. I don't expect the Unite States to include this information on our listings anytime soon, but maybe it will happen one day. In the meantime, we at Crowley Fuel are always happy to give our customers and potential customers a free assessment of your home’s heating system. The Heart-to-Heart Foundation, Inc. was founded in 1995 by Richard “Dickie” Fiske in order to help people dealing with the financial burdens caused by sickness. Dickie, who is spending his retirement years mowing lawns and plowing snow, had heard of too many people in the area who were having problems paying their bills because they, or a family member, had become sick. What Dickie decided to do was to put on variety shows to raise money to give to these families in their time of need. Over the years, the Heart-to-Heart Foundation has put on many shows raising over $200,000, which was distributed to more than 100 people in need, most of whom were suffering from cancer or some rare disease. These shows feature some great talent from the Brookfield area and beyond. In the past we have been entertained by dance schools, karate schools, comedians, singers, magicians and the Corn Cobs! The Corn Cobs is a small band that plays songs that your grandparents grew up with (which is Dickie’s era). The current line-up includes Steve Mantha on piano, Owen King on guitar, Tim Nydam on bass and Dickie Fiske on the washboard/percussion. Lately, the foundation has been holding a successful Poker Run in August that starts in Charlton and ends up in North Brookfield with the riders enjoying a chicken barbeque, thanks to Glenn Waugh and his crew. The foundation has also caught the notice of several foundations and corporations from Worcester and beyond. They recently received a large check from the DCU Center and recognition from the Boston Red Sox. Crowley Fuel is proud to support and work with Dickie Fiske and his Heart-to-Heart Foundation, Inc. It sometimes happens that the people the foundation assists also need heating oil or wood pellets, for which they are unable to pay. We have made many deliveries at a deeply-discount rate over the years for Heart-to-Heart, as we do for another organization, Hearts for Heat. Dickie has always had the help of his family, friends and local communities who know that every penny raised goes to help people in need. For those of you who want to help out with this important work by making a contribution, attending a show or poker run or volunteering time, you can contact the foundation at PO Box 154, North Brookfield, MA 01535, and now you can like them on Facebook! I was interested to find a small graph in the front section of the recent National Geographic (November 2015 issue) that showed the amount of natural gas lost from leaking pipes in the Boston area. You can find it toward the front (no page number) in a section titled, “Cities.” This graph and accompanying text are very helpful in understanding the negative impact that natural gas can have on the environment. For those of you who don’t know, burning heating oil produces mostly CO2 (carbon dioxide), and burning natural gas produces mostly CO (carbon monoxide). After enduring years of utility ads extolling the green virtues of natural gas, it is refreshing to see some truth about the real impact on the environment of transporting it. Certainly there is a fix for the 2,320 leaks detected in Boston, but what is the likelihood that our local utilities will do what Indianapolis has done any time soon? It makes me wonder what a graph of Central Massachusetts gas leaks would reveal. My reason for writing this blog was not to slam the natural gas utilities. They are an important part of our energy sources for Massachusetts, and I truly wish them well. The reason I wrote this blog is to highlight the fact that burning heating oil is not as harmful to the environment when compared to natural gas, which has been indelibly etched into energy consumers’ brains from years of negative advertising. I know that people working in the natural gas industry have been doing the best that they can to address their problems with gas leaks and to offer their customers the most efficient products, but we in the heating oil industry have been working just as hard. It is rare to hear about heating oil leaking into the ground or waterways because of strict laws requiring containment and protected supply lines. We have also been installing new heating systems that are, on average, in the 87-percent range. Crowley Fuel and most other heating- oil dealers in Massachusetts have been making a difference on the environmental impact of the oil that we sell by blending biofuel and reducing sulfur in each gallon that we sell. This does not make us green, but it does make us proud to be doing our share in the important work of keeping our climate cool. it's time to purchase pellets! Crowley Fuel currently has a good supply of premium wood pellets available for new and old customers to purchase in preparation for another Massachusetts winter. We have seen shortages of pellets in the past two heating seasons, and it looks like we can expect the same for this upcoming season. There are few new pellet mills being brought online, and pellets have become an increasingly popular way for people to heat their homes over the past few years. Pellet mills in the area have been operating at full capacity and are not able to keep up with orders from retailers. As you may know, our local trees are mostly hardwood trees, and our local manufacturer of wood pellets is New England Wood Pellets. They sell pellets made from 85-percent hardwood and 15-percent softwood. They have three mills in the area; one in New Hampshire and two in New York. These pellets are very popular and could become very difficult to obtain, even though the mills are working at full capacity. If you want to be sure that you get New England Wood Pellets, it’s a good idea to start planning now. Trebio Premium Softwood Pellets: These pellets come from Quebec and meet the premium standard set by the industry for high-heat output and low-ash content. They have a process to extract the maximum amount of moisture that results in a darker pellet than those made from pine and spruce. Purcell Super Premium Softwood Pellets: These pellets are made from Douglas fir trees, which is the best material for making pellets. They are at the top for heat output, low ash and moisture. These pellets are shipped by rail to a transfer facility in Upton, Mass. and are then processed to remove fines (sawdust) and then bagged to be shipped to the local area. Okanagan Super Premium Pellets: These pellets have been very difficult to impossible to get in the last two heating seasons, but they have made a commitment to the New England market and are much more plentiful. These pellets are also at the top of the list for quality and are also processed and bagged in Upton, Mass. We at Crowley Fuel expect to have a good supply of the softwood pellets going into the heating season and recommend that you come in to buy a few bags to try before making your purchase for the season. Good news for homeowners looking for an efficient and cost-effective way to heat and cool your home! The MassSave and CoolSmart Heat-Pump rebates that were due to expire on June 30 will extend until September 30. You now have an additional three months to take advantage of MassCEC rebates, which range from $750 to $3,375, and CoolSmart rebates, that range from $150 to $300. From our previous experience with this program, the rebates can cover between 20 and 40 percent of the cost to install a ductless mini-split heat pump. Costs for these installations will vary according to size and the amount of labor required for installers and the electrician. Smaller, single-head systems start around $3,750, and larger, multi-head, multi-condenser systems can cost over $12,000. More good news is that, for customers of NStar, National Grid and a few other electricity providers, there is a 0-percent loan available for the additional expense of the installation. This starts with a call to the MassSave program to schedule a free energy audit and obtain the paperwork necessary for applying for the rebate and loan. We will be very happy to help our customers and potential customers through this process. 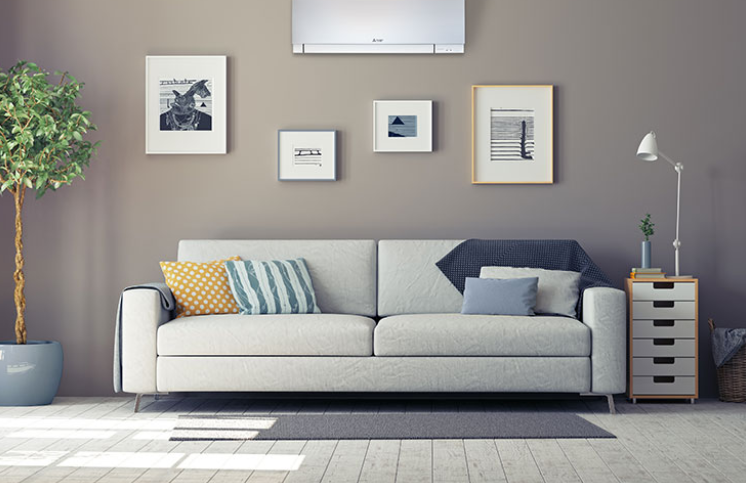 Crowley Fuel installs Mitsubishi ductless heat-pump products, which qualify for these rebates because of their high efficiency. You can learn more about the benefits of a Mitsubishi system by going to their website or by giving our office a call. You are also welcome to visit our office and experience these units working to heat and cool our office. The MassCEC (Clean Energy Center) is funded through the Department of Energy Resources, and they consider heat pumps with a higher efficiency rating, such as most Mitsubishi units, to be a clean source of heating, because they do not burn a fuel to heat a space. The heat is taken from the outside ambient air even below 5 degrees above zero! The CoolSmart rebate is funded with money from electric utilities such as National Grid and NStar, who are also the folks that provide the MassSave zero-percent loan program. Their grant is smaller but still a great help to homeowners who want to have these systems installed. Please do not hesitate to email or call if you are interested in knowing more about a Mitsubishi ductless heat-pump/AC system. My older brother, who lives in Maine and is not a customer of mine, called me last summer requesting my opinion about an offer that he received from his oil company. The offer was to fix his price for oil at $3.75 per gallon for the whole winter. This would mean that he would not pay more than $3.75 no matter how high the prices might go during the heating season. If you remember anything about predictions for heating oil prices last spring and summer, you will remember that things were pretty uncertain, and $3.75 seemed like it was a pretty good deal. This is why he called me, because it seemed like a pretty good deal. Still something was bothering him, so he called his little brother, who sells heating oil, for his opinion. Well, it turns out that it was not such a great deal after all! Prices came down to levels unseen since the early part of the century! I know that we are only 15 years into this century, but I like the way it gives gravity to the fact that fixing prices for last heating season would have been a bad thing to do. Heating oil was selling for over $1.25 per gallon less by the end of the heating season. You may be asking, "What advice did he give to his dear brother?" Well, I told him not to do it! Anyone who knows me and how I write my contracts for heating oil prices (and my brother should have known this) knows that I had a bad experience in 1992 offering a fixed-price contract and swore to never do it again. What I have been doing ever since is offering Cap Price contracts, which sets the highest price per gallon but allows for customers to pay a lower price if prices come down. There is a fee for this option, which covers the difference in price (even if it goes down by $1.25, as it did last season). If you are wondering if my brother took my advice, you'll have to ask him, because I still don't know. So much for brotherly love, but you can be sure that I will give you the same advice as I would give to my brother when it comes to heating your home. 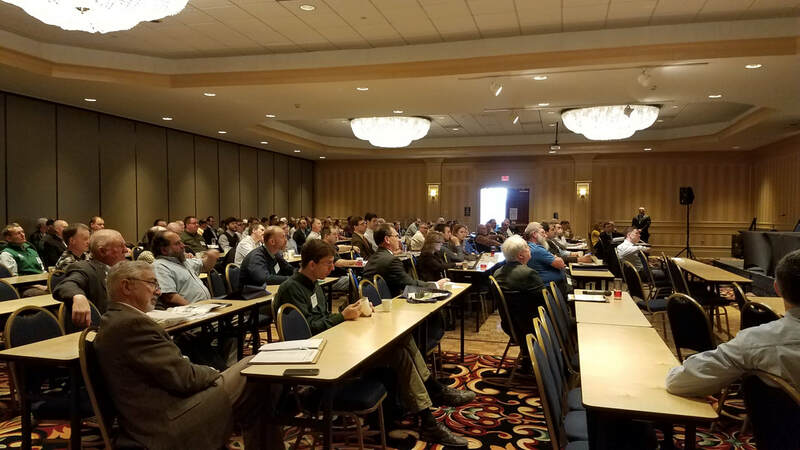 I recently attended the Northeast Biomass Conference held at the Cumberland County Civic Center in Portland, Maine. It was a good showing for most of the principal manufacturers and suppliers of wood pellets in the Northeast. It was the place to be to find out about the future of wood pellet heating in our region. Pellet manufacturers from New England, New York, Pennsylvania, Georgia and Canada were all there, offering to make more pellets available to suppliers in New England for the upcoming heating season. There were also many vendors demonstrating the latest in wood pellet heating technology. There were three manufacturers of central heating pellet boilers in attendance with systems that supply central heating to homes with forced hot-water baseboard heating or air handlers. These systems are capable of handling the entire heating load with very little maintenance work from the homeowner, and bulk bins make it possible to never have to handle bags again. The Workshop section of the conference included some important topics such as keeping biomass green, new EPA standards for biomass and incentives for installing wood pellet central heating systems. There were five states represented on the panel discussing the topic of incentives, and most states had an average of $5,000 worth of incentives per homeowner. The state with the lowest incentive (Maine) had the most pellet systems installed (450). The state with the highest incentive (Massachusetts) had the fewest installations (50). Go figure! The difference seems to be that Maine has done a lot more marketing than any other state and has a more active bulk-delivery system. The good news is that you, customers of Crowley Fuel, have a great opportunity to take advantage of up to $12,000 in incentives and a 0-percent loan for any additional costs. If this sounds interesting to you please give me a call to get more information and a free estimate. Spring is the logical time to start planning for the heat of summer and, if you install a Mitsubishi Electric Mini-Split, you will also be ahead of the game when it comes time to heat your home this fall and winter! Mitsubishi cooling and heating systems are dramatically more efficient than traditional systems, which means you can reduce your energy consumption and save money on your energy bill. We here at Crowley Fuel have been taking advantage of the extra time available from emergency service work to install a couple of new Mitsubishi heat pumps in our new office. One of these units will be installed in our break room on the north side of the building, and the other will be installed in our showroom area on the southeast side. Our electrician, John Tripp, is busy connecting the condensers to the electrical panel with 220-volt lines and will soon finish the job by running a 110-volt line from the condensers to the evaporators on the wall. By the time you read this blog, we will be keeping our office warm and comfortable with our Mitsubishi system. If the weather does take a turn back toward zero degrees, we will be ready, because this system will deliver 100% of the heating required for this space at 5 degrees! I know that many of you don’t believe warm weather will ever arrive, but when it does, we will be ready to keep this office comfortable with this super-efficient cooling system. With electric rates going up recently, it makes sense to install a Mitsubishi system with INVERTER technology, which is efficient enough to receive an ENERGY STAR rating. Being so energy efficient makes installations eligible for federal tax credits, utility rebates and loan programs. All are welcome to come to our Crowley Fuel office at 8 Mill Street in North Brookfield to see our Mitsubishi system in operation. You will not believe how quiet these systems are and how comfortable our office will be. As an incentive for homeowners to install a Mitsubishi heating/cooling system, we will take $500 off the price of installing one of these systems from now until August 31, 2015. 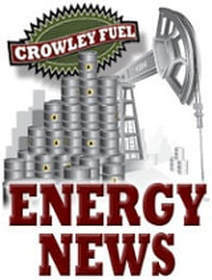 Crowley Is Moving - and - How to Determine How Much Oil Is in Your Tank When YOU Move! By the time you read this, the Crowley Fuel office will have moved from 167 North Main Street in North Brookfield to 8 Mill Street, North Brookfield. We hope you will come by to see our new space in the future and especially on February 13 when we will be having an Open House with gifts, prizes and tours. Moving to the new office is quite a big deal that require lots of work, expense and planning, but it does give us more space to better serve our customers. When you visit, you’ll be pleased to see our new parts, wood pellet and vehicle areas. Our trucks will be under cover and ready for service! When people move to a new home, it is also a big deal. I’ve received a number of calls from customers inquiring about the heating side of moving. The most frequently asked question is, “What do I do about the oil that is left in my tank?” The simple answer is that you get paid for it by the buyers of your home at the closing. Just let your attorney know how much oil is in the tank a day or two before the closing. The easy way to determine how much oil is in your tank is to go by the gauge. When a tank gauge reads Full you have 250 usable gallons, ¾ Full is 188 gallons, ½ Full is 125 gallons, and ¼ Full is 63 gallons. This is all fine if your gauge is resting exactly at these levels, but what about if you are half way between ¼ and Empty? You can make a guess at how much oil is in the tank, but you are taking a chance on shortchanging someone, and I hope that it’s not the buyer. The precise way to determine how much oil is left in your tank is to open one of the ports on the top of the tank and stick a measuring device down to the bottom. 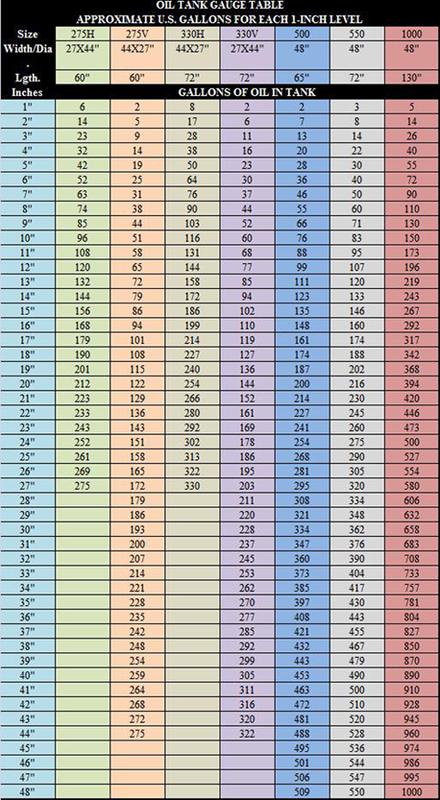 Below is a chart that shows the amount of oil at each inch mark. Please be sure to put the plug securely back into the port after measuring the oil level! If you don’t, the result could be a release of heating oil in the home and an expensive clean-up. The second most frequently asked question is from people who move into a home with oil heat. These are often people who are first-time home buyers or who have never had oil to heat their home. In a future blog I will explain the basics that every homeowner should know about oil heat. Wednesday’s weather made us all realize that winter is finally coming to an end and that it’s time to start thinking about spring and not just about surviving the cold! As you can imagine, we at Crowley Fuel were quite busy with emergency service work these past few months. Repairs are now slowing down, and our hard-working staff are getting some much needed time off. One situation that made this winter’s service scheduling more difficult was the fact that customers were calling to have their heating systems tuned up. We are always happy to provide whatever service our customers want or need when they want to have it done, but with such a cold and snowy winter, it was not always possible to perform this maintenance work. As you would expect, we respond first to customers who have no heat before we can respond to the requests by customers who have heat. It is only fair and reasonable to take care of someone in need first. I am sorry if this winter’s conditions caused us to miss scheduled maintenance appointments. The last thing that most people want to think about in the weeks to come is heating system maintenance, but I would like you to consider having the annual maintenance done this spring. It is the best time for us, and in many cases, the best time for your heating system. For us, spring sees a reduction of emergency service work and heating system installation. It’s the perfect time to keep our service technicians busy with important annual maintenance and tune-up work. For systems such as furnaces that provide only heating (and not hot water), it is essential they be cleaned and serviced before they sit idle for a lengthy time. It is much easier to clean them when they are still warm and dry, because the condensation from summer humidity will cause the products of combustion to harden, making it more difficult to remove in the fall. In order to encourage our customers to have their heating system serviced this spring, Crowley Fuel is offering a Spring Tune-Up Special of $160! This price includes up to two hours of labor, a nozzle, oil filter cartridge and, if necessary, a fiberglass air filter, oil pump strainer and oil burner coupling. Any other work and parts will be charged at current rates. This offer ends on June 30 when our labor rates are scheduled to increase.